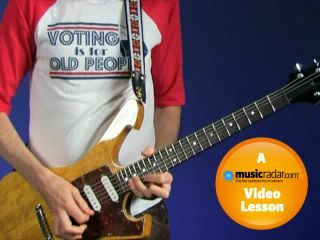 In this video lesson, Paul Gilbert demonstrates a typically high-octane picking lick - in this case, a 3-note per string idea high up the neck. The first sextuplet in bar 1 below is the simplest as it just ascends and descends the scale, so mastering this part of the lick should be your first priority. Playing this high up the neck has its difficulties, however. You may find your fingers feel 'squeezed' in because the frets are so close together. Try practising the lick in a lower position to begin with. For example, you can play the lick 12 frets lower down the neck so that the notes will be an octave lower, and thus still in tune with Paul on the video. The second half of the lick stretches out of your fret hand's natural position. This is easier higher up the neck, but your priority should be to fret the 22nd fret D note with your fourth finger and to pick it with an upstroke. A good starting point is to play at half tempo and focus on alternate picking so that each sextuplet begins on a downstroke. Lay off the distortion to help you pick more cleanly. A distorted sound will hide any minor errors in your picking.